The EU Action for Smart Villages initiative was launched by the European Commission in 2017. Smart Villages are rural areas and communities which build on, and enhance their existing strengths and assets through creative thinking and by embracing innovation to create desirable places for rural people to live and work. In creating a Smart Village, community groups and individuals often overcome local challenges by exploring and implementing practical and tangible solutions. In particular, rural communities explore how local services, such as health, social services, education, energy, transport and retail, can be enhanced and sustained through the deployment of Information and Communication Technology (ICT) tools and community-led actions and projects. As such, digitisation is key to the creation of a Smart Village; however, social innovation is also paramount. The concept of Smart Villages therefore is not prescriptive and there is an acknowledgment that there is ‘no one size fits all’ model that can be applied universally. This in turn allow EU Member States broad discretion on how to plan for, and implement this innovative initiative in their respective countries. 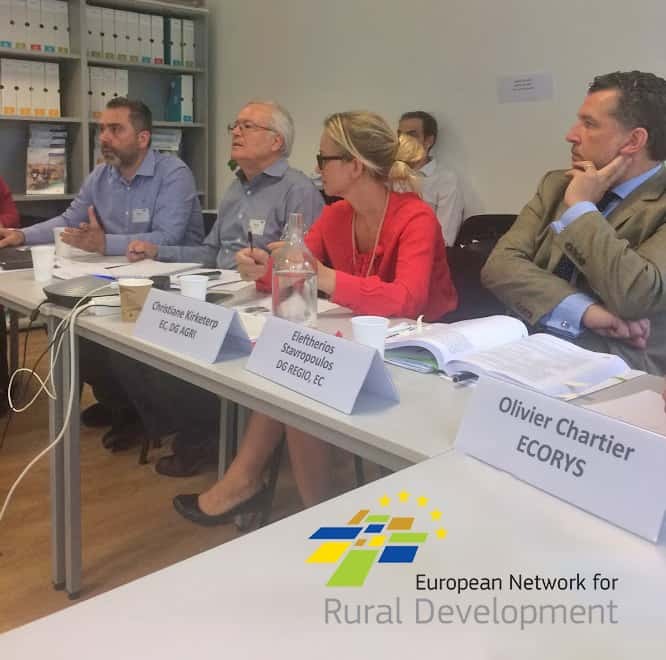 A European Network for Rural Development (ENRD) Thematic Group (TG) on Smart Villages, launched in September 2017, contributes to the EU Action for Smart Villages by enabling the exchange of innovative ways of creating more vibrant, sustainable and attractive rural areas, and also by exploring how Rural Development Programmes (RDPs) and other financial instruments can best be used to support this. Seven Smart Villages TG meetings have taken place to date. Dr Shane Conway, Researcher at NUI Galway is participating in this TG on behalf of the National Rural Network. According to Dr Conway, ‘essentially Smart Villages, and Smart Rural Towns in an Irish context, are rural communities that put measures in place to help retain and attract people to live and work in their locality, be it through practices of digital innovation and/or social innovation’. The development of Smart Villages in Ireland, and indeed across the EU, can be greatly enhanced through the successful delivery of the LEADER Programme 2014-2020. Established by the European Commission in 1991, LEADER is widely regarded as one of Europe’s most successful rural development programmes. The LEADER approach is based on 7 key principles – all of which must collaborate and positively interact for it to be successful (see Fig. 1). 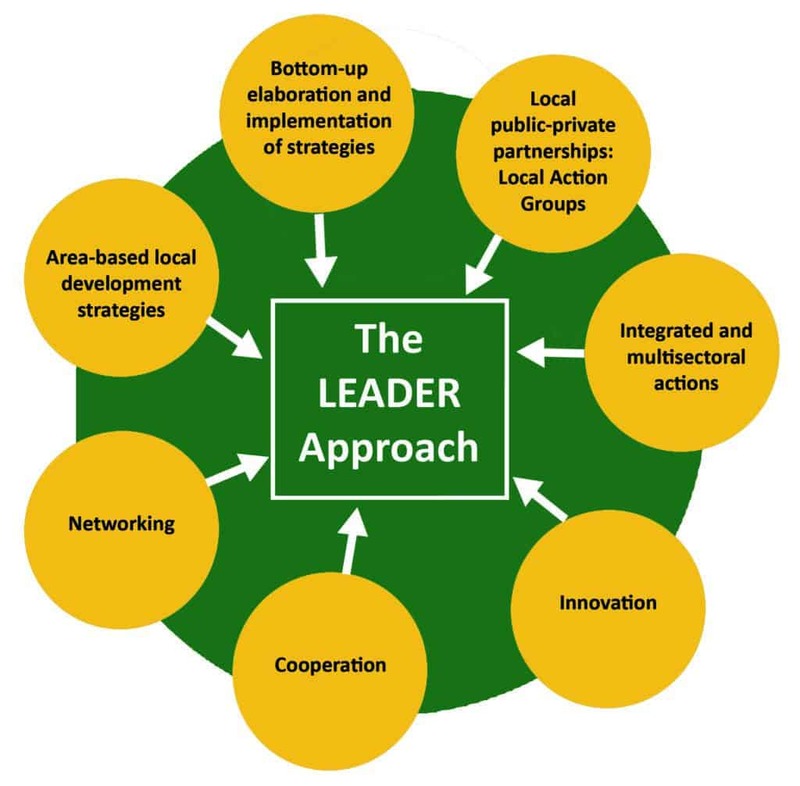 The LEADER Programme is therefore well positioned to become the key policy ingredient and catalyst towards the ‘smart’ revolution of rural towns and villages in Ireland, particularly through its community-led approach to rural development. Rural development strategies and projects are considered to be more effective and efficient if decided and implemented at local level by local actors. Through this ‘bottom up’ framework, LEADER supports the delivery of local development actions which address the overarching needs of rural communities throughout Ireland and other EU member states in an innovative, integrated and inclusive manner. Indeed, the LEADER programme in Ireland already focuses on, and includes three core themes (i.e. 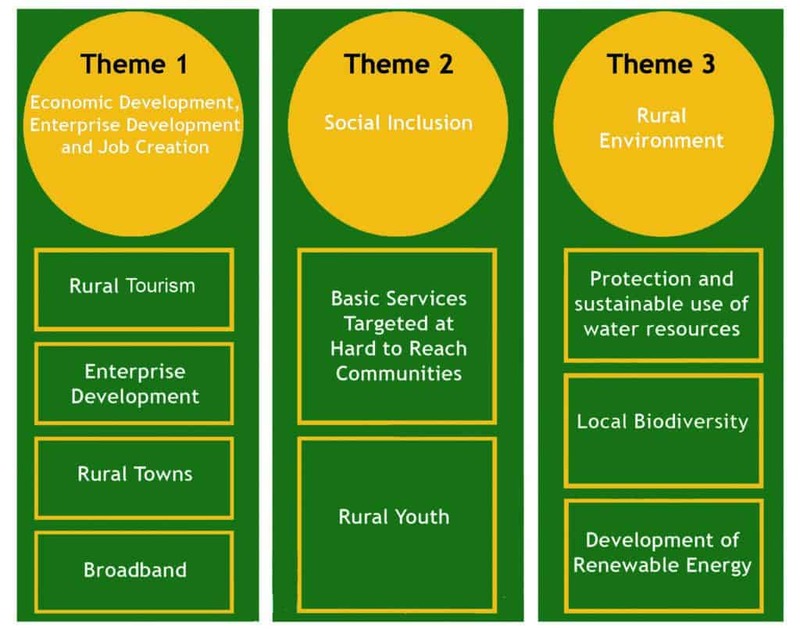 (i) Economic Development, Enterprise Development and Job Creation, (ii) Social Inclusion & (iii) Rural Environment) (see. Fig 2) which, taken together, constitute the fundamental principles of what the European Commission consider is needed to create and attain a sustainable Smart Village. The EU Action for ‘Smart Villages’ concept is also closely aligned to Ireland’s new ‘Smart Community’ initiative, launched by the Department of Rural and Community Development & the Department of Communications, Climate Action and the Environment in January 2019. This innovative initiative is a new approach that aims to bring exposure to digital content and technology in rural communities, and also to support rural dwellers in discovering the value of using digital in their daily lives. Creating synergies between the EU Action for ‘Smart Villages’ concept and Ireland’s new ‘Smart Community’ initiative through increased levels of collaboration, has the potential to greatly improve the quality of life for people who live and work in rural towns and villages throughout Ireland. The realisation of ‘smart’ rural areas and communities can play a key role in the development and sustainability of rural Ireland by tackling issues, such as depopulation, limited employment opportunities and out-migration. 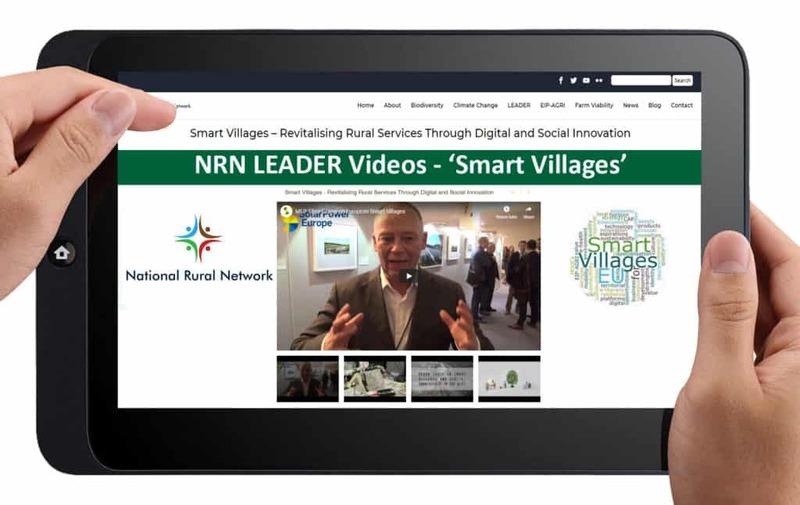 Ten informative videos related to the EU Action for ‘Smart Villages’ are featured on the LEADER-themed video channel on the NRN website. The NRN would like to sincerely thank the European Commission – DG Agriculture and Rural Development the European Network for Rural Development (ENRD), the EU Strategy for the Alpine Region (EUSALP), OriginTrail, SolarPower Europe and the Smart Village Network for kindly allowing us to feature their content on our website to inspire rural Irish communities. Download the Smart Villages and Rural Towns in Ireland – Case Study Poster/Leaflet which accompanies this case study. For more information on the ‘Smart Villages’ initiative, please visit the ENRD Smart Villages Portal to discover a plethora of inspiring networks and initiatives across the EU.